They lie and scam. My name is Rylan Maksoud. As a freshman at UT, on September 24, 2017, I signed a lease with University House Austin for the next school year. The guarantor agreement was signed on October 3, 2017. Both were countersigned by the general manager, Cai Mailhes, on October 4, 2017. I paid $306, including a $6 credit card fee, for the administrative fee and security deposit on November 22, 2017. As soon as we signed the lease, and they didn't have to sell to us anymore, management at University House Austin became difficult to work with. We weren't too worried though. At least we had a place to live next year. We were wrong. "We regret to inform you that the apartment type you selected at University House Austin is now sold out for the 2018-19 term. We have elected to terminate your 2018-19 Housing Agreement dated September 24th, 2017. 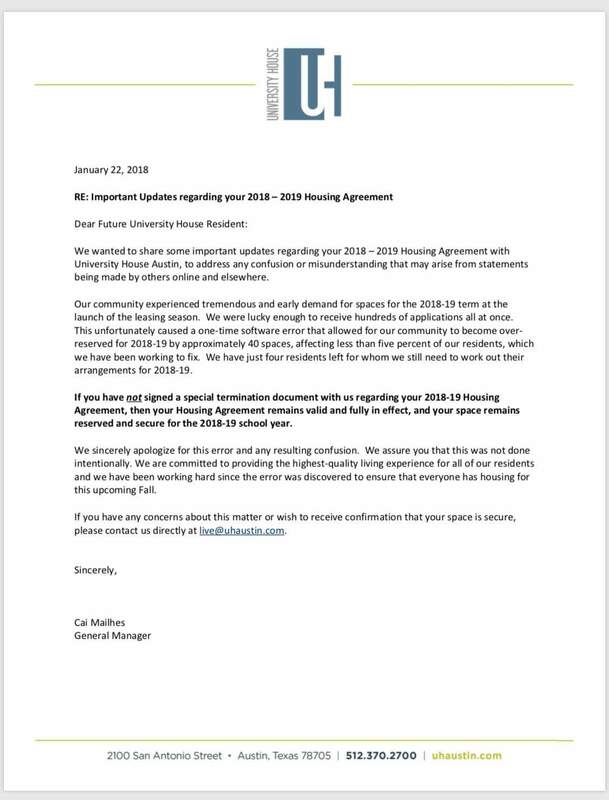 A space is no longer being held for you at University House and you owe nothing further under the 2018-19 Housing Agreement, which is now terminated." The e-mail subject line was "Mutual Termination- University House Austin." However, this termination was not mutual in the slightest, and came without prior notice. There is no provision in the lease that allows for this unilateral termination. Click here to read the lease and see the two signatures which make it a binding contract. I dare you to find any provision that allows this unilateral termination. This unilateral termination happened to my roommates, and to many other people over multiple years, as evidenced by the admissisions of multiple employees, and the personal accounts of others on review sites and Facebook pages. This is simply their established business practice. University House Austin's notice of intent to breach contract came late in the leasing season and was a rude Christmas gift. Many places had filled up already, and the few places that were left had jacked up rates. However, my roommates and I just had to eat the cost and sign somewhere else. I demanded compensation for the price difference and a refund for the $306 that I already paid University House Austin. Tiffany Fulkerson responded 4 days later saying that they'll send a check for what I already paid, but will not offer any compensation for the price difference. Multiple times, they have tried to trick us into signing a form that says we agree that it is a mutual termination. They successfully tricked most, if not all, other students. Only after I refused to sign it and made this website did any consideration of compensation begin. I had repeated communications with an executive at the national Scion Group which manages University House Austin. After 21 days, I receieved a check for $300 instead of $306. Also, I was offered a settlement agreement where they agree to pay me for the difference in lease rates, $2880, in exchange for silencing myself. Before paying me, they demanded that I take down this website, withdraw all my reviews and complaints as resolved, and never speak about this again. I feel that would be completely unfair to all the other students that just accepted what happened to them and did not complain because they assumed big corporations can get their way. I told them that I would take down the website if they offered compensation to everyone they did this to, but they said it's "not realistic." I was told that I was the only person that was unhappy, but 38 complete strangers have approached me since I put up this website that say the same thing happened to them and that they're extremely unhappy. Their legal department doesn't want to make things right. They just want to shut me up. Read the settlement agreement yourself. In addition, University House Austin lied to the Better Business Bureau and claimed that they had reached an agreement with me in an attempt to close my complaint with them. Their lies never stop. Stay away from University House Austin if you don't want this to happen to you! UPDATE 01/23: University House Austin has released a statement and made comments to the media claiming that this was a one-time software error, contradicting my review. I stand by what I wrote. I know the names of four people that say this happened to them last year. One of them, Michael Zetune, was called months after signing a lease, and was told that 4x4's were sold out, and that he had to sign for a 3x3, which has a higher price that he currently pays. Also, click here to listen to part of a phone call with Christina Emanuele, Regional Vice President at the national Scion Group which manages numerous properties across the country, including this one, where she states that this happens every year and refuses to compensate everyone else this happened to. She even acts as if I should be happy she's not saying "too bad, so sad for everybody." I didn't want to release it, but I can't have my credibility be attacked like this. If this was truly an error, they would have done the right thing and compensated everyone this happened to, like I requested. Also, check out this Daily Texan article, which includes an account from Najlae Chidmi, and this KXAN article, which includes accounts from Michael Zetune and Jerry Che. That article details how students who did not make websites have not gotten their money back yet. UPDATE 01/29: In the KXAN article a few days ago, Eric Bronstein, co-founder and executive vice president of the Scion Group had the audacity to claim, "Much of what Rylan Maksoud has been saying about University House is not true" without identifying a single untrue statement. This new Daily Texan article identifies at least five students, including Michael Zetune, Jacob Sepulveda, and Anoop Kumar who had their leases illegally terminated by University House last year and made to sign new leases for different, more expensive units, contradicting the Scion Group's previous claims that this was a one-time software error. My advice to Eric Bronstein: Refocus your efforts from crafting the next lie to running a legitimate business. UPDATE 02/07: The Scion Group hired a lawyer in El Paso to respond to my 60-day DTPA notice. In an attempt to limit their liability under the law, I was offered virtually the same deal I was offered before, "in exchange for... a cessation of disparagement activities." I informed him on January 26 that I respectfully reject any offer that requires me to waive my First Amendment rights. I have yet to hear back. Instead of being obsessed with stifling the truth, the Scion Group should have compensated everyone already. Also, check out this Daily Texan article about the lack of legal justification for University House's actions, and this KUT article. UPDATE 07/10: Without an attorney, I filed a lawsuit against University House on June 14 for violations of the Texas Deceptive Trade Practices Act. The law allows me to triple my damages, so the suit is for $7,722, not including court costs. To defend themselves, University House hired two lawyers (with a combined 40 years of experience) and a paralegal out of a national law firm. Currently, the suit is waiting for a hearing date to be set on my motion to strike their ridiculous affirmative defense they've already declared to the court. They claim they've already tendered me the money without conditions. They are referring to the January 26 letter where they clearly state I must agree to take down this website and never speak about this again before receiving the compensation they previously admitted I'm owed. It is unfortunate University House continues to refuse to act ethically and right their wrongs. It will take months before this is resolved legally, but I will update this website and the e-mail list on any significant developments. If you'd like to view the case record, click here, go to civil records, search by case, then enter the case number: J5-CV-18-249053. UPDATE 10/16: The jury trial is set for Friday, November 2nd at 9AM in the Justice Court, Precinct 5 of Travis County. We had a hearing in front of the judge on August 21 and it went very well. See article. The trial is open to the public. If you are interested in testifying about what happened to you, or if you simply want info on attending, feel free to contact me. FINAL UPDATE 11/24: On November 2nd, I showed up to trial with witnesses and copious amounts of evidence ready to prove that University House had the following predatory business practice over at least the last two years: They sign more leases for cheap floorplans than there are apartments available. Then, after waiting many months into the leasing season to cut down on the number of options that students have, they contact the students and tell them that their lease is gone. At this point, when the students, the vast majority of whom are first-time renters and teenagers, are in a panic, University House offers a saving grace. They just managed to find an empty room in their building. The catch: The floorplan is always more expensive. Unfortunately, right before trial, the visiting judge granted their attorneys' request to suppress any mention of this practice, or the recordings of their Vice President admitting to it, to the jury and disallowed me from calling my witnesses. To avoid the potential expense and time cost of an appeal, I settled with them right before the jury walked in for $4500, almost double my damages of $2631, but less than triple my damages, which is what I was asking for under the law. The major victory was finally getting them to drop the condition that I take down this website and never speak about this again. You may have seen the Daily Texan article. Unfortunately, instead of turning over a new leaf, the new management that replaced the fired management from last year released a false, unprofessional statement that humorously insulted me. As for the fate of this website, my original offer still stands. If University House compensated all ~50 students they did this to, not just the ones that have the privilege to devote hundreds of hours and dollars to a lawsuit, this website will come down. Unfortunately, that is "not realistic" in the words of their Vice President. If you were a victim, I strongly recommend contacting an attorney. Thank you to everyone for your support. If the same thing happened to you, please file a complaint with the Attorney General here and a complaint with the Better Business Bureau here. And don't forget to review them on Yelp. Feel free to contact me at uh@rylanm.com if you would like to discuss this.